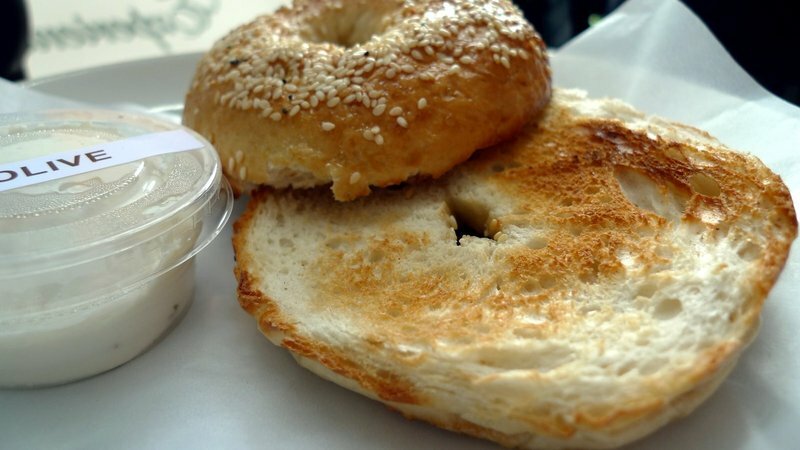 First it was the cheesecake; now the bagels have arrived. There seems to be a growing affinity for things New York (or, at least, things perceived to be in the New York style) here in Bangkok. This trend first caught my attention a few months ago with the opening of NYCC – the New York Cheesecake shop at the Crystal Design Center. In the last few weeks we’ve added another source of New York style carbs to the local dining scene: bagels. While I’m no bagel expert, I do recognize that a really good bagel must be boiled before it is baked. Simply steaming them (as is done in a lot of faux bagel shops) just produces doughy round bread. In fact, last October I made two attempts at making bagels, just to understand the processes better. Thankfully, I don’t need to rely on my own bagels anymore as I can now stop at BKK Bagel Bakery to purchase some freshly boiled and baked bagels. Tawn and I made our first visit to BKK Bagel Bakery during their soft opening in late February. At this point they had at least a half-dozen types of bagels, several types of cream cheese spreads, and also several sandwich offerings. Sadly, the pastrami recipe has not yet been unveiled. We tried a simple toasted bagel with a cream cheese and olive oil spread, which had a nice, nutty taste. 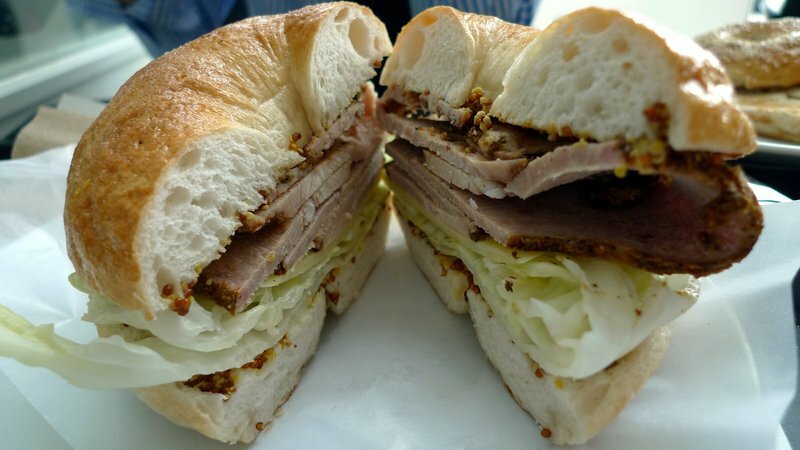 I tried a roast beef sandwich that was alright but nothing to write home about. Besides using iceberg lettuce, the roast beef was a little dry. All of the flavor came from the generous helping of whole grain mustard. For the price – about 250 baht (roughly US$8) – it was a little pricey. A week ago, I stopped by a second time to bring home some bagels for breakfast. The bagels themselves are quite nice with a good chewy texture and dense crumb. Again, I don’t claim to be a bagel expert but these certainly remind me of the bagels I’ve bought from bodegas in New York City. I’m eagerly awaiting their attempt at pastrami, though. Located in the ground floor of Maneeya Center, adjacent to the Chidlom BTS station, BKK Bagel Bakery should have a ready supply of customers: not only is Chidlom in the heart of the high-end expatriate community but the Foreign Correspondents’ Club is located in the Maneeya building, too. I wonder what will be the next New York food to be introduced here? This entry was posted in Uncategorized and tagged Bagels, bakery, baking, Bangkok, Center, Chidlom, Chitlom, food, Krungthep, Maneeya, New York by christao408. Bookmark the permalink. The grocery store that I work in has started offering fresh bagels at a very reasonable price…I love their cinnamon and raisin bagels with a bit of cream cheese…and the cinnamon crunch ones are good too. I find them every bit as satisfying as the really pricey ones at Panera Bread!!! I’ve never been a big fan of bagels because of how hard it can be. I much prefer croissants! The only time I get to eat Bagel is when I’m in Starbucks. 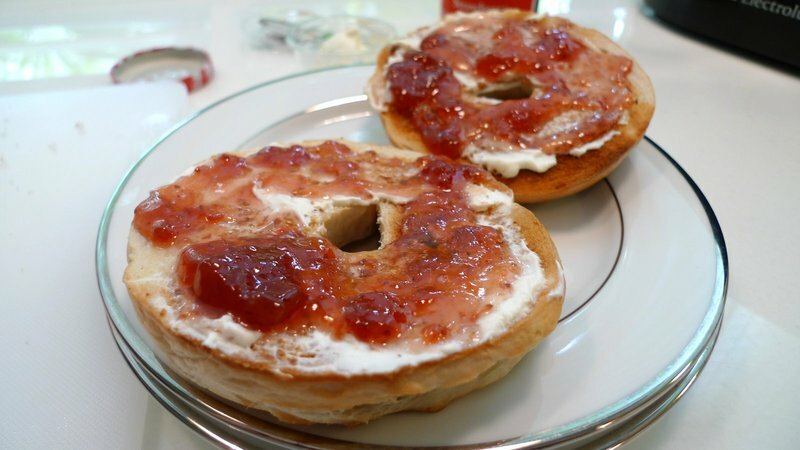 Yummy bagels – we have a shop here which produces excellent bagels and scones. “Word Of Mouth” is the name. They only serve breakfast and lunch. Yummy. There is a bagels cafe in the neighborhood where my store is located. Opened sometime in January- not good and too expensive. I’m so glad you have a source for the bagel – We have to have them in the house at all times or there would be a revolt! Enjoy your NY style bagel. yum, bagels! 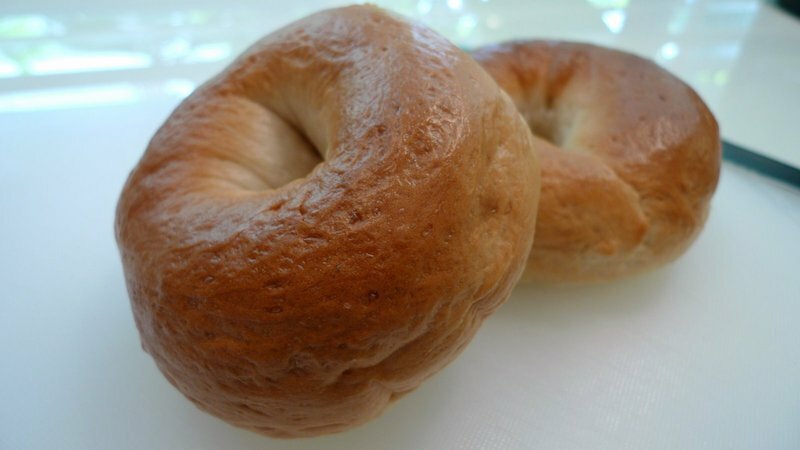 the only time i don’t like bagels is after a big race, usually because i’ve over-dosed on them during training… they’re a great way to get carbs before a run without causing stomach upset. hmm! i did not know that bagels needed to be boiled first. the things you learn on any given day! I love bagels. There’s a different style of bagels in Montreal. It’s sweeter and perfect right out of the oven. @ElusiveWords – For my multiple trips to MTL, somehow have never tried. @ThePrince – Yes, they just don’t have the same texture if not boiled first. @kunhuo42 – Is that so? I didn’t think about their benefits to runners. @let_the_right_one_in – For a sandwich, yes. Granted, it is the priciest sandwich on their menu. @murisopsis – If I didn’t bake my own bread, I’d probably have bagels on hand full-time. @portiajules – Carbs aren’t inherently evil… =D@Dezinerdreams – Oh, that’s no good…@swtaznxtc90 – That sounds tasty. Have never tried. @Fatcat723 – Clever name for a breakfast/lunch type of place. That’s what I would like to open here, a small place only open for breakfast and lunch. @oxyGENE_08 – And I imagine those are a bit lacking…@yang1815 – They have. @moolgishin – The quality of the cream cheese really does make a difference, doesn’t it? @Roadlesstaken – You’re not supposed to buy the two-day old ones… =P@Redlegsix – Cinnamon crunch? Have not heard of that type. What’s it like? @icepearlz – Me, too. Chris…the Cinnamon Crunch Bagels are basically plain bagels with a Cinnamon/butter mixture that is drizzled over the top of the bagel…yummy!!! @yang1815 – That’s what I was wondering too!